Showing off their artwork, seasonal employees Mackenzie and Greg share a laugh while presenting one big wreath! Want a fun winter outing with friends and family? Broad Run Tree Farm is the best place to go. A small family-owned tree farm off of Shadyside Road offers everything you want. friendliest people you will come across, both during the holiday season and throughout the rest of the year! Show up to enjoy a festive day filled with free tractor rides, free hot chocolate, and handmade wreaths. Mike did not open the farm for a profit in money, but instead to create a fun environment and meet new people. Regulars come back year after year because of the great hospitality. Even if you already have a tree or cannot find one of your liking on the farm, the Caporellis welcome you to come hang out anyway! 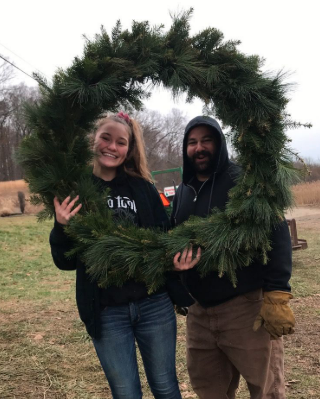 In addition to their beautifully shaped trees and holiday hospitality, Broad Run Tree Farm known for their their phenomenal handmade wreaths. Working in the little white house are a few select high school girls that cut and hammer away all day to keep up with the crowd. One employee, Megan Keiy, says “We constantly get complimented on the wreaths we make… as soon as we make one up, it is bought right out of our hands.” Many customers come back year after year just to get the beautifully made wreaths. Mike works year round to trim the trees to make sure they are as perfect as they can be! There are many trees to choose from on the farm, but they do not tend to grow past 8 feet tall because they clear out every year and do not get the chance to grow taller. Often, people tell stories about how they have visited Broad Run Tree Farm for as long as they can remember. They have a tradition that they wish to carry on throughout the years. Start your own holiday tradition by visiting Broad Run Tree Farm in Coatesville this holiday season!